This project was initiated in March 2009. Its primary objective was to transcribe the Wotton Survey1 and publish it online in order to make it available to researchers. 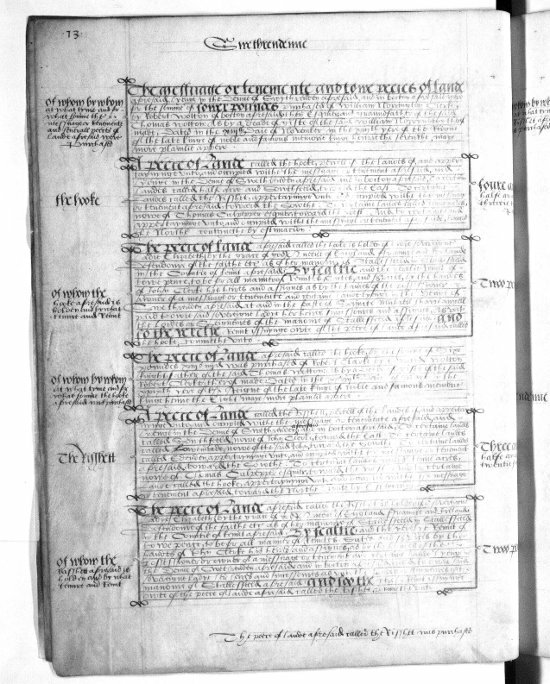 A secondary objective was to enable those participating in the project to acquire, or improve, palaeography skills. The Survey was still in the possession of the Wotton family, and still in use, in the early seventeenth century, after Edward Wotton had been ennobled; there is a note about the proceeds of a sale that had come ‘to your lordship‘s use.' 4 Its subsequent history is uncertain. The Wotton male line ended with the death of Thomas Wotton’s grandson, also Thomas, who died in 1630. Over the next three centuries, the Wotton estates, and the papers relating to them, were dispersed to a variety of owners through inheritance or sale. Thomas Wotton the younger left four daughters. By the marriage of the eldest, Catherine, to Henry Stanhope, Boughton Malherbe and other Wotton lands passed to the Stanhopes, Earls of Chesterfield. Thomas Wotton’s library, and many documents relating to the former Wotton lands also passed to the Stanhopes. In 1955 the Mann-Cornwallis collection was deposited with the Kent Archives service in Maidstone, where it remains. If the Survey had been in the possession of the Mann-Cornwallis family, it seems likely that it would have been deposited with the rest of the papers. The Survey, however, is not part of either the Mann-Cornwallis collection or that of the Kent Archaeological Society. If it ever was in the possession of the Mann family, it must have been disposed of separately at some date between 1750, when the Wotton estates were acquired by Galfridus Mann, and 1955, when the papers were deposited with the Kent Archives. Possibly, however, the Manns had never had the Survey. According to a note in the volume, the Survey was at one time 'in the handes of Thomas Lambard of Sevenoke in Kent'.7 This could have been either Thomas Lambarde who died in 1745, great-great-grandson of the historian and antiquarian William Lambarde, or Thomas Lambarde’s son and heir, another Thomas, who died in 1769. Possibly the Survey passed into the possession of the Lambarde family at the time the former Wotton lands were sold to Galfridus Mann in 1750. The Survey, with associated documents, is bound in a volume of 365mm by 285mm. It is written on vellum in a good sixteenth century hand. The ink is brown, with rulings and decorations in red. In all there are 338 folios, or 676 pages. The pages were numbered at the time the survey was written up. Folio numbers have been added at a later date. In the transcript, we have used the original page numbers. The survey is bound in gatherings of two leaves - that is, the scribe has used sheets of vellum folded once to make two folios, or four pages. Where he has started a new sheet, but not needed to use all of it, there are blank pages. For example, the survey of Newestedde in Staplehurst is on pages 416, 417 and 418. Page 419 is blank. The survey of Whiteherste in Marden covers thirteen pages, 397-409. The following three pages are blank. Sixty seven discrete units of land are described in the Survey. Each section is headed with the name of the land being described. Sometimes it is an entire manor, sometimes a farm or tenement, sometimes what appears to be an assortment of fields, pasture and woodland. Each section begins with a preamble identifying the land and stating when and by whom it was surveyed. Each field or piece of pasture or woodland is described in a separate paragraph. The name of the piece of land is given in the left hand margin. The main body of the text describes the land, its bounds and usage, and the name of the occupier or ‘fermour’. The acreage or the yearly rent due from the land is given in the right margin. Each section concludes with an account of how the land came into the possession of the Wottons, by what feudal tenure it was held and what rents or customary services were due from it, and finally whether the land was subject to gavelkind. In order to carry out the transcription, a group of volunteers was recruited in May 2009. Some were experienced in reading sixteenth century handwriting. Others were complete beginners. Digital images were supplied on CD by the British Library. The volunteers worked from A3 sized paper copies of the digital images. These black and white copies were slightly larger than, and more legible than, the brown ink on cream vellum of the original. The volunteers worked with speed and efficiency and transcribing was completed in March 2010. Every page was then checked at least once by someone other than the person who transcribed it. We have done our best to remove all mistakes and typos, but it is not possible to be certain that the transcript is one hundred per cent error free, or that all members of the group have interpreted sometimes unfamiliar terminology in the same way. The scribe himself was not always consistent in his capitalisation of place names and personal names, or in the way he formed his capital letters. He had three ways of writing the letter ‘d’, for example. However, it is not so clear that west is always intended to be capitalised. The scribe wrote the name Wotton many times, using several different styles for the initial W.
We decided how to transcribe these on a case by case basis. To assist transcribers and checkers, the end of each line in the document was marked in the transcribed text by a slash mark / and a line break. These have been retained in the published version. The scribe did not use many abbreviations. Where they occur, they have been extended by the transcibers, with the letters added between square brackets: cont[eynethe]. Words inserted into the text by the scribe himself are indicated with chevrons: ‘the manoure <of Burscombe> aforesaid’. Because the Survey is bound in a volume, some of the marginal notes could not be captured in the digital imaging process, and the first few letters of some lines in the main body of the text were also lost. It was found possible to recover most of the marginal notes from the volume in the British Library. They were added to the transcript prior to publication. Spelling of place names and personal names is inconsistent. A piece of land in the manor of Bocton is spelled Cheryels, Cheriels, Cherils and Cherilles on the same page. A piece of land in Eynsford is variously spelled Tittlea or Tyttlea. An occupier of land in or adjoining the manor of Colbredge was Christofer Edynden, Idenden or Idendenne.9 Boughton (Malherbe), however, is always spelled ’Bocton’. We have not attempted to standardise or modernise spellings in the transcript. However, in this introduction, a single spelling will be adopted for the name of each place or individual referred to. For parish names, the modern spellings will be used. While the Survey itself is in English, the volume contains several associated documents in Latin. These mostly relate to the Wottons’ title to their estates and to services and obligations issuing out of them. They include the Inquisition Post Mortem on the lands of Nicholas Wotton, great grandfather of Thomas. There is also a lengthy enquiry into the liability of the manor of Bocton for payment towards the maintenance of Dover Castle. These Latin documents have been transcribed but not translated. The volume also contains a copy of the Act of Parliament of 1548-49 by which the lands which then formed the Wotton estate were disgavelled. The Survey is a valuable resource for the study of landscape, land usage, tenure and feudal obligations in Kent. It is hoped that this transcript will be of use to scholars and local historians and enable research that will increase our knowledge of the county in the sixteenth century. We would be glad to hear of any research or publication based on the Survey. Where books or articles are available online, a link to the website is given at the first reference. However, a subscription or password may be required to access some material. 1. British Library (henceforward BL) Add. Ms. 42,715, henceforward Survey. 2 Michael Zell, ’Landholding and the land Market’, Early Modern Kent 1540-1640 (2000), p.65. The Wotton family and its place in Kent is discussed in Part II of this introduction. 3. Gavelkind, its significance to the Wotton estates, and Thomas Wotton’s reasons for carrying out the Survey, are discussed at greater length in Part III. 5. Centre for Kentish Studies (CKS) U24 Mann Cornwallis papers. 7. BL Add. Ms. 42,715. 9. Survey, pp. 65, 361, 30, 31.